Take advantage of the special! Get a horsehair pottery vessel, pendant and earrings for $99 – shipping included! 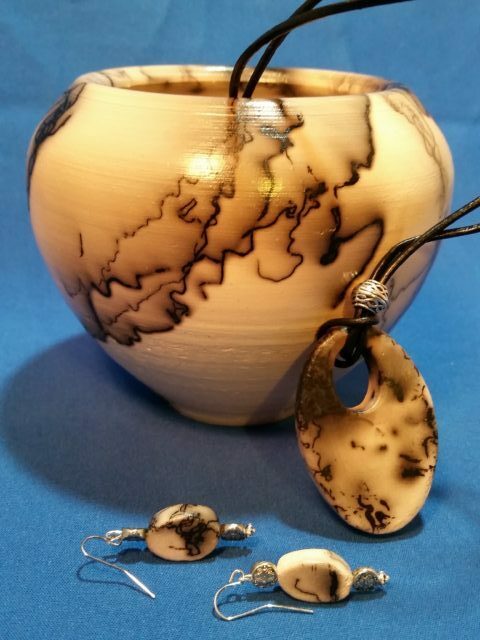 Horsehair pottery is made from a white clay that has been bisque fired to a lower than usual temperature. This leaves the fired clay body quite porous, enabling it to absorb the carbon from burning horsehair. Later, the bisque is warmed up in the kiln to about 1000 degrees Fahrenheit. When it is removed, individual strands of horsehair (or pet hair), preferably from the tail, are laid against the hot surface. If the temperature on the surface of the piece is just right, the hair will attach to the pot, shrivel up, and begin to burn. As the ash forms, a deposit of carbon and smoke is absorbed into the clay surface, leaving a permanent trace of the hair. As the temperature falls below 900 degrees Fahrenheit, the pot will no longer accept the hair, and the process is over. When the ashes are washed away and the piece is completely dry, it is polished with wax. Because horsehair pottery must be porous in order to achieve the effect, it is not to be used as a water vessel for fresh flowers. Its use is solely as a piece of art to enhance the décor of your favorite room or to make a statement about your appreciation of your pet. It makes a nice conversation starter if you take it to work. If you like I can carve the name of your pet on the bottom of the vessel.